The Cape Pygmy Owl is a tiny owl with a round head and no ear-tufts. It is also known as the Baja Pygmy Owl. Typical call - La Laguna Meadow, Baja California, Mexico. June 2001. © Dan Lockshaw. Description: The facial disc is similar to other Pygmy Owls. Eyes are yellow, rimmed by the blackish edge of the eyelids. Eyebrows are whitish. The cere is pale greenish-grey and the bill is greenish-yellow. The Crown is finely spotted with whitish, and the nape has two large blackish or dark brown spots, edged whitish above and pale buff below (false eyes). Upperparts are sandy grey-brown with a reddish tint that is more prominent in females. The mantle and back are irregularly spotted pale, while the scapulars have pale buff spots. Flight feathers are barred light and dark, and the tail feathers are dark brown, normally with six incomplete narrow whitish bars not reaching the central shaft of the feathers. Underparts are off-white, with prominent whitish-brown mottling and streaking. The sides of the upper breast and parts of the flanks are mottled greyish-brown. The rest of the underparts are densely streaked dusky. Tarsi are feathered and the yellowish-grey toes bristled. Claws are horn with darker tips. Size: Length 15-17cm. Wing length 86-89mm. Tail length 61-66mm. Weight 50-65g. Females are heavier than males. Habits: Little studied, probably similar to other species of Pygmy Owls. 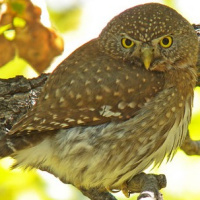 Voice: The male's song is a sequence of equally-spaced short, single notes that are relatively higher pitched than other pygmy owls, and with a downward-inflection towards the end - kwiu kwiu kwiu... The intervals between the notes are about one second. This song is often preceded by a quavering wuwuwuwu. Hunting & Food: The Cape Pygmy Owl feeds on Insects and other arthropods, small mammals, reptiles and small birds. Breeding: Little known. Likely nests in old woodpecker holes. Habitat: Pine and pine-oak forest about 1500-2100m above sea level. May move to deciduous forest at lower altitudes during winter (down to about 500m above sea level). 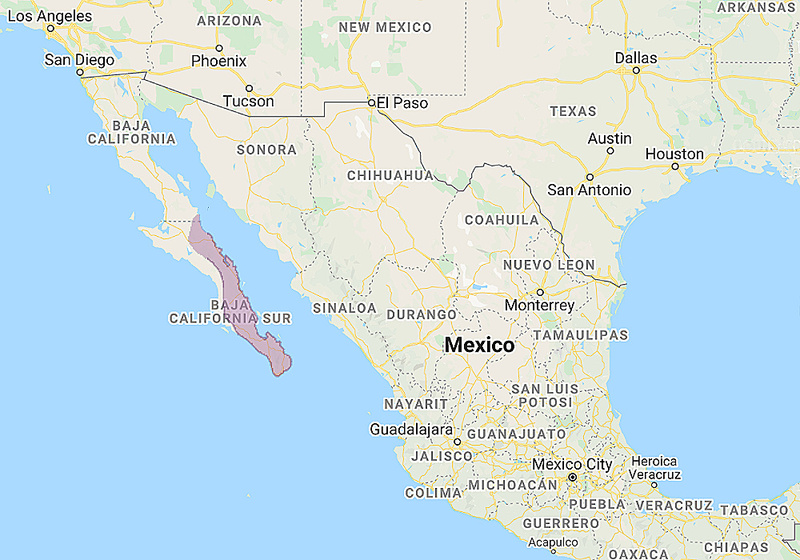 Distribution: This Pygmy Owl is endemic to the mountains of South Baja California, down to the cape. Original Description: Brewster, William. 1888. Auk 5: p. 136.
del Hoyo, Elliott & Sargatal. 1999. "Handbook of the Birds of the World: Barn Owls to Hummingbirds". Buteo Books. Johnsgard, Paul A.. 2002. "North American Owls: Biology and Natural History". Smithsonian. 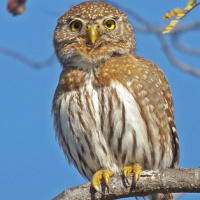 See also: Other owls from North America, Genus: Glaucidium. Page by Deane Lewis. Last updated 2015-11-18.